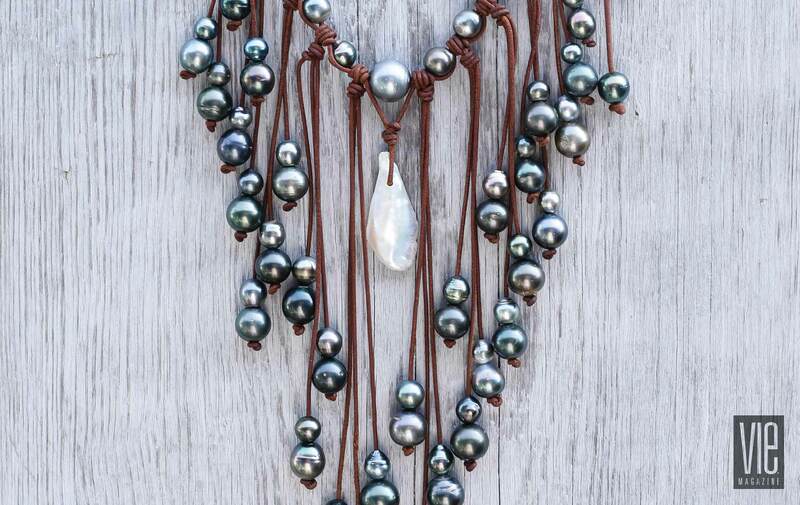 This necklace features seventy-two Tahitian pearls and a central baroque pearl on hand-cut conditioned leather. 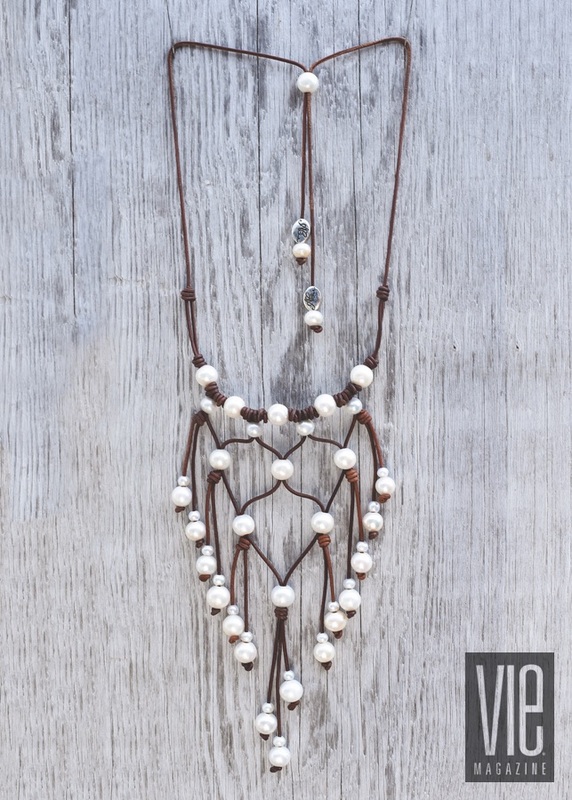 It’s no surprise that artist and jewelry designer Allison Craft enjoys piecing together her hand-constructed pearl and leather jewelry on the beach. Everything about being at the water’s edge—from having her toes in the sand to soaking up the glow of a beautiful sunset—resonates in the works of this Albany, Georgia, native who now resides in Grayton Beach, Florida. After graduating from Georgia Southern University in Statesboro, Craft taught elementary school in Atlanta for about seven years. To illustrate how dedicated she was to her work, Craft, who then lived in north Atlanta, split her time between two schools in different parts of the city and taught some 1,800 students a week. Despite lots of driving and a crazy schedule, she always found time for creativity. Precipitated by the arrival of their first child, Craft and her husband returned to Albany to be closer to family. In the ensuing decade, Craft had another child and worked four days a week—her daughter and son had their mom as their art teacher—all the while making jewelry and painting. Craft gained a reputation in Albany for her whimsical and capricious murals and paintings, mermaids and the sea being central to their themes. Having become friendly with the owner of a local dance studio where she had painted a mural, Craft made a trade with the studio’s owner that would be a foreshadowing of a life yet to be discovered. In exchange for a week’s stay at the studio owner’s Panama City Beach, Florida, vacation home, Craft painted backdrops and did stage design for dance productions. Craft likes to keep busy, even during vacation, and so found herself on the beach making jewelry. In those early years of trading her skills for time at the beach house, Allison had no idea that the area along Scenic Highway 30-A existed just a few miles west of Panama City Beach. A bit of a perfectionist, she personally makes everything she sells in her store, which is located in the colorful Shops of Grayton. For four years after her initial move to the area, Craft worked from home—and on the beach. She also shared studio space with photographers Jackie Ward, Shelly Swanger, and the late Sheila Goode. As Craft’s business grew, her jewelry designs also evolved. She holds fast and true to the idea of creating jewelry out of what interests her. She doesn’t hesitate to incorporate handwrought metal or semi-precious stones with her signature pearls and leather, always in pursuit of producing something unique that she likes and would wear. Additionally, she is clever about making many of her pieces transformational; necklaces can be wrapped around a wrist in such a way that they become a bracelet, or a longer necklace can become a choker. Craft explains, “I like options myself.” A bit of a perfectionist, she personally makes everything she sells in her store, which is located in the colorful Shops of Grayton. A friend of Craft’s compliments her by telling her she’s good at guerrilla marketing, to which Craft counters, “I call it being broke.” In 2010, she took it upon herself to style a friend—a mother of sextuplets—who would be appearing on an episode of The Rachael Ray Show. She decked out the entire family in pearl and leather jewelry, including the children, the children’s grandmother, and the children’s aunt, all of whom appeared on air. What a coup for Craft; an editor of Rachael Ray Every Day magazine wound up featuring Craft and her work in the publication, which has millions of readers. Ray herself became a fan, and Craft displays an image of the talk show host wearing an original pearl and leather necklace from Allison Craft Designs while on a visit to the White House. No stranger to celebrities who are fans, Craft is a music enthusiast who has ingeniously made musicians aware of her work. Craft draws inspiration from songs and goes to great lengths to research their meanings and the lives of the musicians who wrote them. Every year, she identifies in advance several musicians who will be playing at the 30A Songwriters Festival, researches their work and lives, designs and makes custom pieces, and gives them away. Among those musicians and celebrities who can be seen wearing her designs are John Oates, formerly of Hall and Oates, Amy Grant, Shawn Mullins, Kaci Bolls, the Tennessee Titans cheerleaders, Chas Sandford, Kelsey Waters, and Sam Bush, who won’t go onstage without his neck piece, which was inspired by the Karyn Williams song “Ordinary Angels”—he even has a backup. On the heels of a marriage separation in January of 2012, Craft signed the lease of her first retail space at Shops of Grayton in February. She recalls the fearful period: “It was the first time I had been on my own, and it was with three children.” With a bootstrap mentality, Craft was undeterred by the circumstances. Whether you call it guerrilla marketing or being broke, the hustle paid off; on her first day of business, Craft sold enough jewelry to cover that month’s rent. She has amassed numerous accolades, including South Walton Artist of the Year for 2012 and Perfect in South Walton Awards for Best Jewelry Boutique Grand Champion in 2015, Judge’s Choice in 2016, and Best Retail Collective in 2017. Life changed quickly for Craft in 2012, but she has a real “keep on keepin’ on” attitude. Her pearl and leather jewelry designs are her bread and butter, but she continues to paint for the pleasure of it. 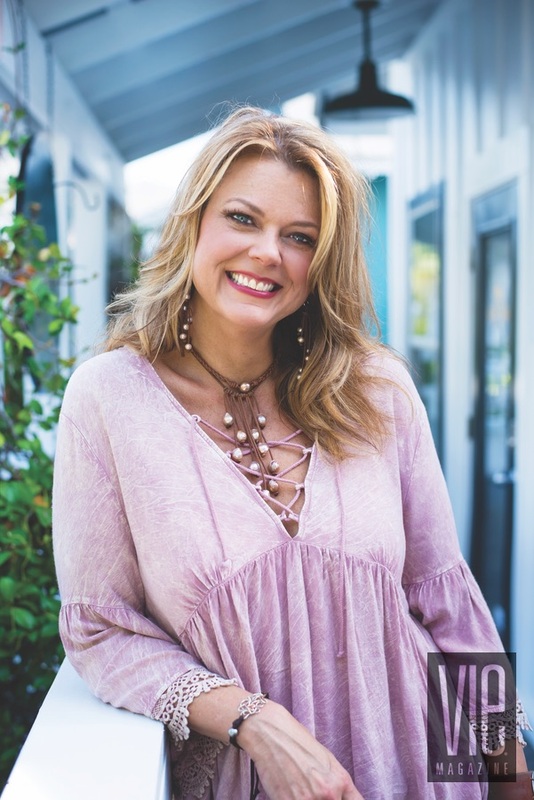 She has amassed numerous accolades, including South Walton Artist of the Year for 2012 and Perfect in South Walton Awards for Best Jewelry Boutique Grand Champion in 2015, Judge’s Choice in 2016, and Best Retail Collective in 2017. With the loving assistance of Scott Henderson, the man in her life and her partner in business, Craft is allowed the time to consider unique projects, like a collaboration with Rock Hard Designs Jewelry, created by her late friend, designer Rocky. There’s no doubt that this landed mermaid will stick to her unique style and that she will continue to handcraft unique pieces of jewelry using unconventional objects and techniques. If she can drill it, it can be incorporated into an Allison Craft original. For someone who doesn’t like to make the same thing twice, who lets the pearls and other jewelry components guide her, it makes Craft happy to think about the unfettered jewelry designs and paintings she’ll make. Learn more or see the mastery for yourself when you visit Craft’s website and the Allison Craft Designs store in Grayton Beach.